YDP-C71, Digital Piano from Yamaha in the Arius series. Yamaha launches the Arius YDP-C71PE Console Digital Piano at Winter NAMM 2012. The YDP-C71PE's sound and Graded Hammer (GH) action makes it suited as a practice piano while also built to handle heavier use at institutions. 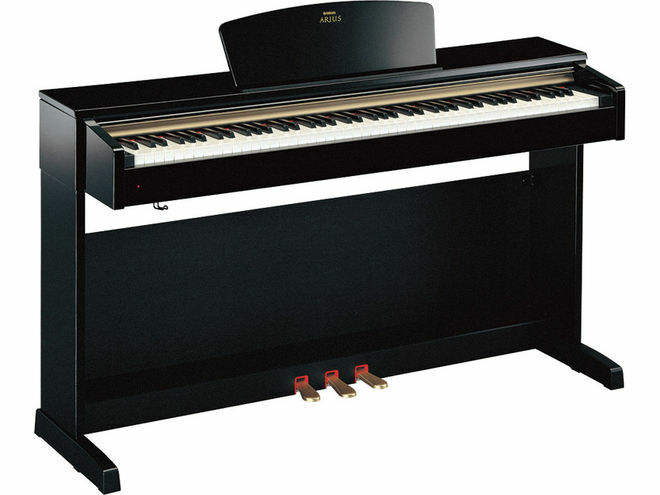 The Yamaha Arius YDP-C71PE provides piano touch and tone in a Polished Ebony cabinet. The damper pedal features a half-damper effect, which provides different levels of sustain. A two-track song recorder captures musical ideas and is also suited for practicing -- using one hand at a time or both -- with the built-in recordings of selections from the standard piano repertoire. Dual headphone jacks allow two people to sit at the instrument and play, practice or teach in privacy. The Arius YDP-C71PE is slated for shipping in February 2012. Visit Yamaha for more details. [NAMM] New Korg SV-1 Models The Korg Stage Vintage Piano has been given a matte black stage finish. [NAMM] Roland RP301R Roland introduces the RP301R Digital Piano. [NAMM] Roland RP301 Roland announces the RP301 Digital Piano.